Around three months since the MetOp launch campaign was put on-hold, we are restarting the launch campaign. The first members of the team arrived here in Baikonur on 10 July. Since then, every week, different specialists have been landing to support the launch campaign operations. So, most of them will spend a summer in Baikonur with temperatures that reach 50°C. About two months of preparations are necessary to bring the spacecraft to a point where it can be filled with propellant. In fact, this is the same point at which the ‘nominal’ campaign was stopped. 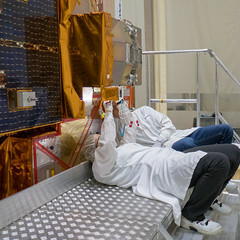 Starting with reconditioning the spacecraft batteries, the plan is to remove the spacecraft from the container where it was stored to keep it thoroughly protected from the environment. After that it is necessary to perform quite some activity to integrate the battery panel, the deployment mechanism of the solar array, and few other panels to allow easy access to the different locations of the satellite. In addition, we will restore the configuration of for the platform and for the instruments, which can stay in flight configuration for no longer than a well-defined limited period before the launch. After all the mechanical operations are completed, an aliveness test of the satellite will give us the final answers we want before we release it for the propellant filling. By then, it will be about the end of August, but not the end of the hot season here in Baikonur.